People's Task Force rallies outside Kym Worthy's office June 17; Pres. Marilyn Jordan is at center in orange shirt; Exec. Dir. Kevin Carey at left. 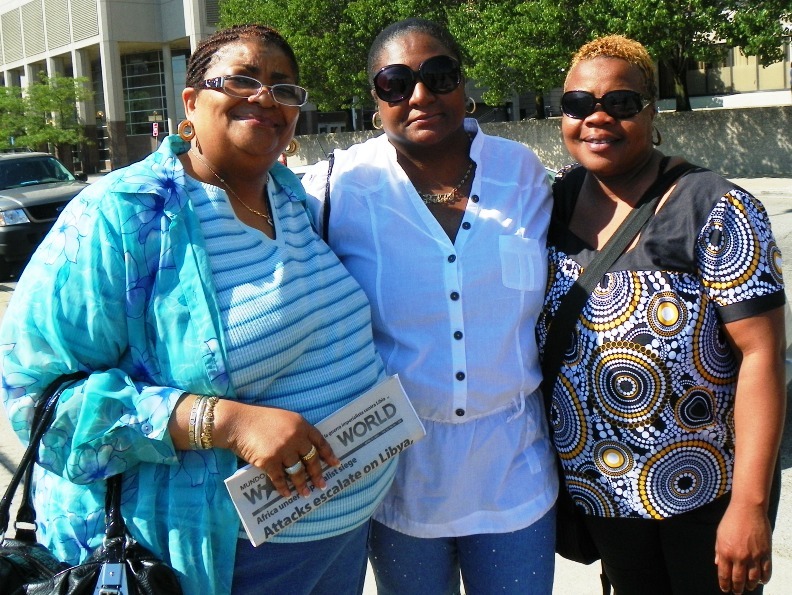 DETROIT – Families of prisoners packed the streets outside the Frank Murphy courthouse in downtown Detroit June 17. 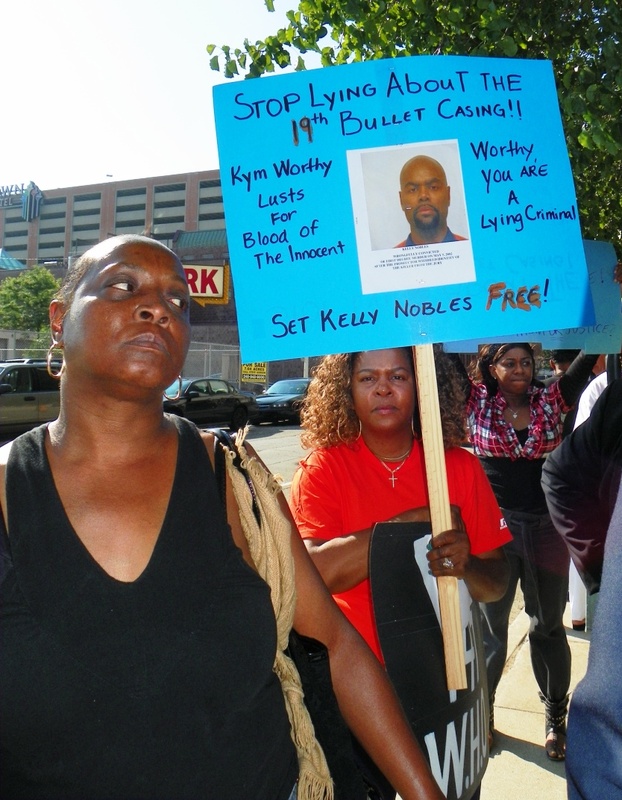 They denounced Wayne County Prosecutor Kym Worthy for not re-opening the cases of their loved ones, who they say were convicted based on deliberately falsified forensic evidence. They also called on Worthy to charge Police Officer Joseph Weekley and others who shot seven-year-old Aiyana Stanley Jones to death after bombing her home in Detroit in May of last year. 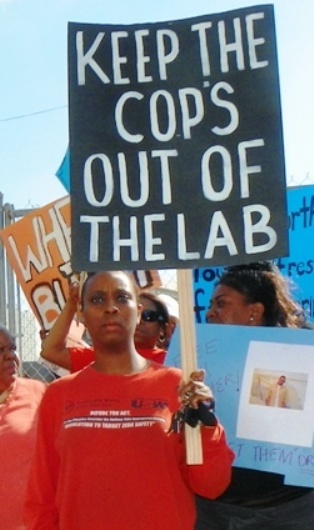 The Detroit police crime lab was closed in 2008 after an audit showed its firearms unit, staffed by police officers, produced false results in at least 10 percent of its cases. 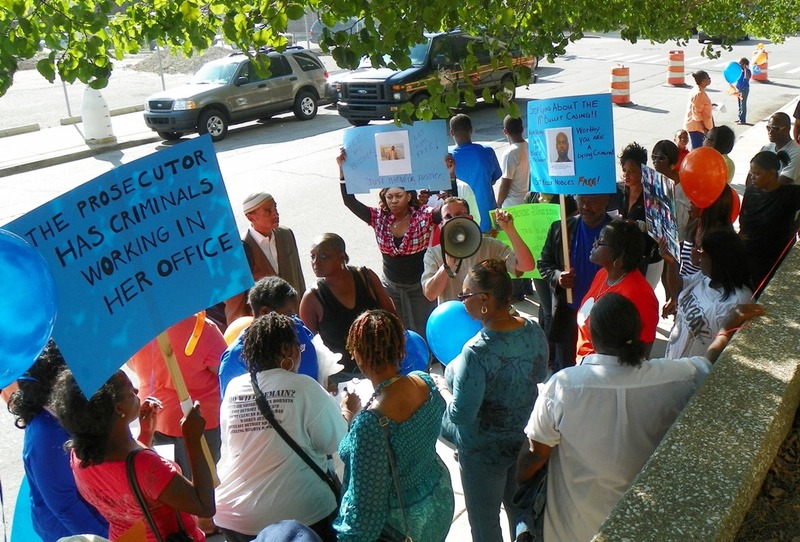 “WE ARE NOT GOING ANYWHERE UNTIL OUR DEMANDS ARE MET!” declared Marilyn Jordan, president of the Detroit Peoples’ Task Force to Free the Wrongfully Convicted, whose son is serving a life term in prison. 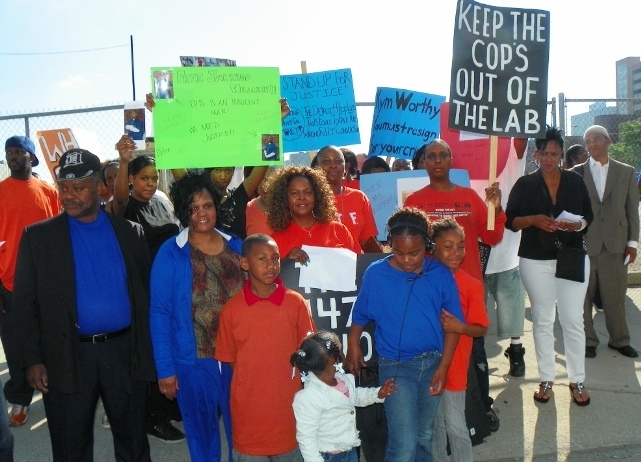 The Task Force is a coalition founded by prisoners themselves, along with their families and advocates. 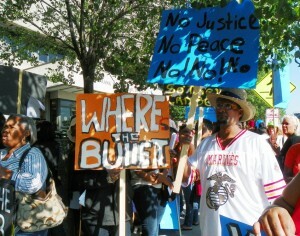 At least a hundred people were at the protest, chanting, “Worthy is Worth-less,” and “What are we going to do? Walk like an Egyptian!” They released blue and orange balloons into the sky at the conclusion of the rally, representing the hoped-for freedom of their loved ones. MDOC prisoners usually are required to wear blue and orange uniforms. Task Force paralegal Roberto Guzman said their members will meet with U.S. Representative John Conyers (D-Detroit), head of the House Judiciary Committee, on June 28 at 1:30 p.m. to ask for federal intervention. They plan to hold a “peace rally” at the same time outside the Detroit federal court building where his offices are. 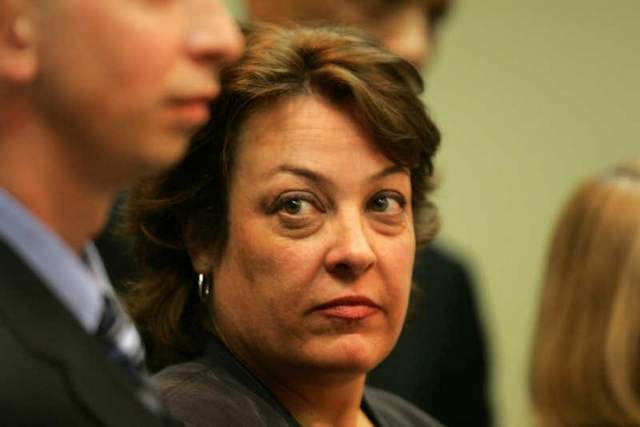 The current City Council approved funds for Worthy’s investigation in 2010. She claimed she would investigate all cases brought to her, including 147 questionable cases identified at the time. She later limited her review to convictions from 2003 to 2008, involving only firearms evidence, and recently said it was not possible to comb through all 31,000 cases from those five years. 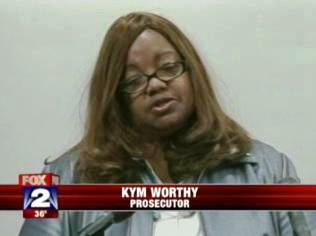 Only four cases have been re-tried since Worthy began her investigation, with three re-convictions resulting. She has refused to re-try one case. In May, large amounts of forensic evidence from cases under investigation at the time the crime lab closed were found in the building which housed it, the former Stephen Foster Elementary School. The building was open to trespass and in deteriorated condition. Among cases Worthy has refused to review is that of Jordan’s son, Kelly Nobles, 36, who was convicted in 2002 of first-degree murder and related charges, just outside her arbitrary time limits. The victim was Nobles’ best friend. Jordan said forensics evidence, including a 19th shell casing proving more than one gun was used, was deliberately kept out of his trial, in retaliation for his refusal to plead to lesser charges. 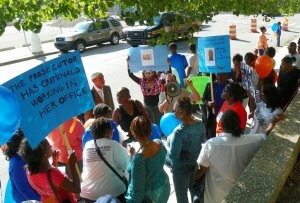 Jarrhod Williams' sister Dominique Manuel and mother Valarie Watts at right demand his freedom, in case that shut crime lab. 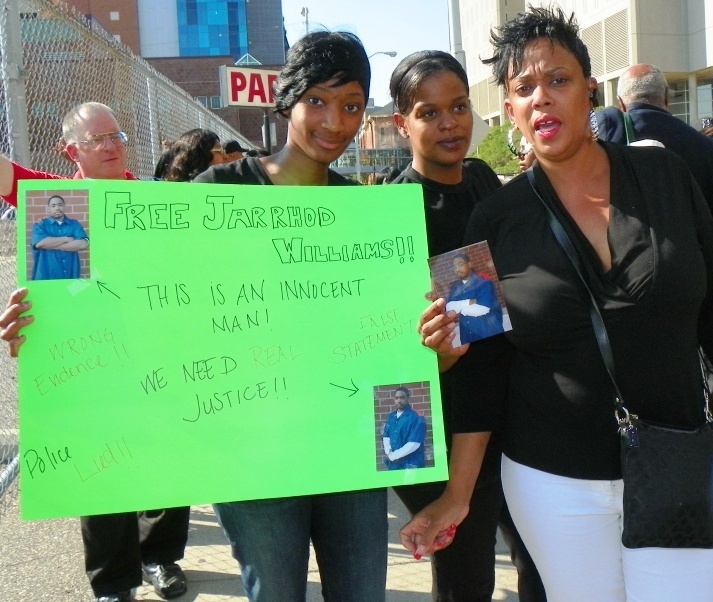 The family of Jarrhod Williams, 24, including his mother Valarie Watts and sister Dominique Manuel, was present with signs and photos of their loved one. 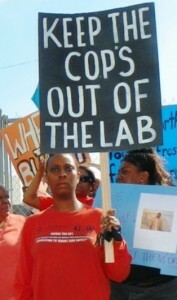 “It was my son’s case that shut down the crime lab,” Watts said. Jordan calls her the “mother” of the Task Force. 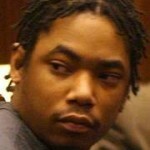 Williams initially confessed to the shooting deaths of two men in May, 2007 in exchange for a reduction of charges to second-degree murder. Williams said all along, however, that his confession was coerced, and withdrew his guilty plea after the broadly-publicized exposure of falsified evidence. The same scenario occurs in many cases, said families at the protest. Black defendants take plea bargains even if they are innocent, because the alternative is facing juries composed predominantly of suburban whites who tend to believe whatever the police say. In Williams’ case, Detroit police officers, who staffed the firearms unit of the crime lab, claimed all 42 spent shell casings at the scene came from Williams’ gun. When State Police re-examined the casings, at the request of Williams’ attorney at the time, Marvin Barnett, they found that they came from at least two different guns. Worthy would not drop the case. Instead of throwing out the evidence and dismissing the case, Wayne County Circuit Court Judge David Allen ordered a new trial. 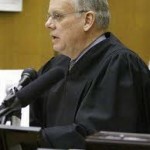 Williams was re-convicted by an all-white jury in 2009 during a trial presided over by Judge Timothy Kenny, Watts said. Watts said she is retaining an attorney to take her son’s case to federal court. 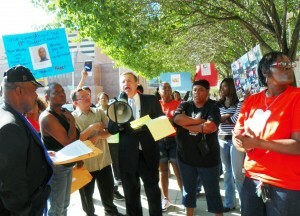 Worthy faces charges before the attorney grievance commission related to the case of Alexander Aceval, Moffitt’s client. 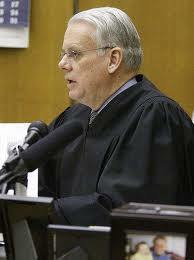 As a result of the highly publicized scandal, former Wayne County Circuit Court Judge Mary Waterstone, former Assistant Prosecutor and Narcotics Unit head Karen Plants, and two Inkster police officers were convicted in March, 2009 of committing perjury in Aceval’s case. With the full knowledge of Plants and Waterstone, the officers did not disclose to Aceval’s jury that the chief witness against Aceval was a paid informant who had the drugs in his own car trunk. Despite the perjury convictions, Aceval is still serving 10 to 15 years in prison, having lost all appeals at the state level. Worthy allowed Plants to continue in her position until the charges were brought by State Attorney General Mike Cox. Plants is currently serving a six-month term in prison, and the other parties are awaiting sentencing. Video of interview with Moffitt after arraignment of Plants, Waterstone and the Inkster officers is below. Latonia Lindsay’s son Joseph McNoriell, 30, was convicted of assault with intent to commit murder and sentenced to 15 to 25 years in 2002, again outside Worthy’s time limits. 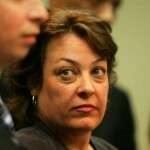 Erika Williams has been active with the Task Force since it testified before City Council in 2008. The City Council as constituted at that time voted unanimously for a federal investigation of the crime lab scandal, despite Worthy’s appearance before them. 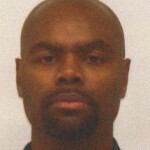 Her husband is Terrance Lonzell Williams, 38, who is serving a sentence of 30 to 60 years for second degree murder. He was convicted in 2005. 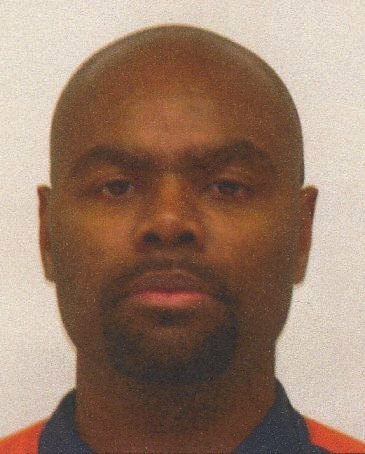 Williams told this reporter after the 2008 City Council hearing that police had confiscated a gun from Williams during a traffic stop, than later used that gun and a bullet they said was fired from it to convict him for a murder that happened later. His first trial resulted in a hung jury, but the prosecutor’s office re-tried him and he was convicted the second time. 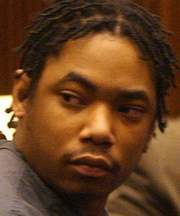 Toriano Johnson, 40, was sentenced to life without parole in 2001 on three counts of felony murder, among other charges. Johnson’s aunt Paulette Strayhorn and cousin Tina Williamson attended the protest in his support as well. One of the protesters, whose name is being withheld to avoid retaliation, said he served five years in prison on a firearms charge, with police using an inoperable gun they found down the street as evidence. He said he was stopped in his car by police for no reason, and that they conducted an illegal search of the car three times over, finally coming up with a quantity of heroin. He said the drug charge was dismissed in 36th District Court, but the police got two witnesses to say they saw him throw the gun out of the car before the stop. James Burbridge, 20, is serving five to twenty years for armed robbery and carjacking. He was convicted in 2010, putting him out of Worthy’s 2003-08 time limits. Comments from Kym Worthy’s office on the allegations made by the Detroit People’s Task Force are included in an earlier VOD article, at http://voiceofdetroit.net/?p=7930. To read official speech from Task Force delivered by Roberto Guzman during rally, click on Speech by Detroit People’s Task Force. To contact the Detroit People’s Task Force to Free the Wrongfully Convicted, call Marilyn Jordan, at (313) 784-4021, Kevin Carey, at (313) 887-4344, or Roberto Guzman, at (313) 272-1406. 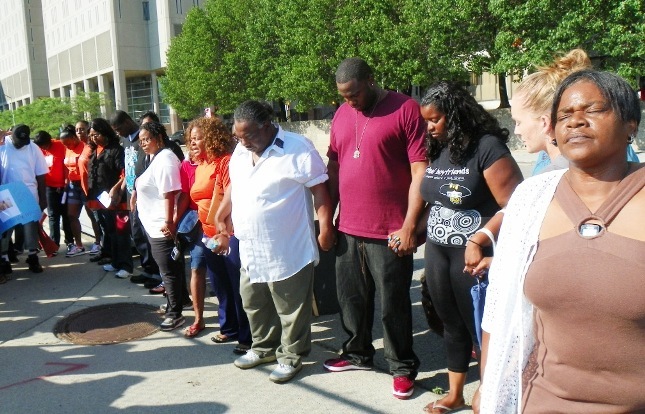 Families pray for justice for loved ones at end of rally.